The Best Wildlife Youtube Channels from thousands of top Wildlife Youtube Channels in our index using search and social metrics. Data will be refreshed once a week. About Youtuber The Brave Wilderness Channel is the one stop connection to a wild world of adventure and amazing up close animal encounters. Follow along with adventurer and animal expert Coyote Peterson and his crew as they lead you on three exciting expedition series. About Youtuber Discover amazing new animal species & learn about the world's deadliest & most mysterious creatures with new wildlife videos every week. Epic Wildlife is an educational & entertaining animal channel dedicated to making learning about nature fun and enjoyable for adults and kids of all ages. Here you'll find interesting animal facts, giant snakes, man eating saltwater crocodiles, etc. About Youtuber All the latest, exciting and authentic wildlife videos coming from around Africa. We share amazing footage that has never been seen, so come and see them! About Youtuber My Name Is Miller Wilson, I am 14 years old Throughout my videos, I am going to bring you closer to nature, from cute little creatures to down right deadly snakes, And all animals in between. About Youtuber We are the Wildlife Aid Foundation and have been saving wildlife in the UK for over 30 years and been the heart of the television series "Wildlife SOS" for over 15 years on Animal Planet. We will be adding new videos here every week to show you the intimate goings on as they happen here at Wildlife Aid. About Youtuber Showcasing both the beauty and brutality of African nature. The latest wildlife sightings feature animals seen on safari such as lions, leopards, elephants, giraffe, buffalo, zebra, cheetah, wild dogs, hyena and many more African animals. Unique footage of African wildlife is showcased, cute baby wildlife, wildlife mating, predators killing to survive, animals living their natural lives. About Youtuber Kruger National Park. This video channel is about Kruger National Park and all the surrounding Game Reserves.We showcase videos of the Greater Kruger Park and its animals. Kruger National Park, South Africa has some of the best wildlife scenery in Africa. If you want a real South Africa Safari experience. About Youtuber To whom that love nature wild life, our work here is to collect amazing videos that related to wild life and some awesome animals. About Youtuber When you visit our Deer Trail channel you will see a panoramic view of the pond cam, the log feeder cam, the table cam and be able to view our other cams. About Youtuber The world’s leading conservation organization, WWF works in 100 countries and is supported by 1.2 million members in the United States and close to 5 million globally. WWF's unique way of working combines global reach with a foundation in science, involves action at every level from local to global, and ensures the delivery of innovative solutions that meet the needs of both people and nature. About Youtuber To manage and conserve the natural and cultural resources of Texas and to provide hunting, fishing and outdoor recreation opportunities for the use and enjoyment of present and future generations. About Youtuber I'm a wildlife educator with common exotic animals and one Canada Lynx. All are ambassadors educating the public. I possess a federal and state license to exhibit and educate with these animals. My videos are either training videos with Max in the beginning or just fun videos of my animals. About Youtuber The finest live cams in HD from the MPALA reserve in Kenya, Africa. EXPLORE.ORG is the largest live nature cam network on the planet. We bring nature to you, raw, unscripted, and unedited. Enjoy the natural world as it unfolds in real time in front of our cameras. EXPLORE.org takes you from Kenya, Africa to the riverbanks of Katmai, Alaska and everywhere in between. About Youtuber This is a channel for large animals, for every prehistoric life. Big animals, how each species lives. These wonderful images, help us gain more knowledge of the species in nature. About Youtuber Original footages of Real Animals in Real Situations in Africa. Unique footage of African wildlife is showcased, cute baby wildlife, wildlife mating, predators killing to survive, animals living their natural lives. All videos were captured at Inyati Game Reserve in South Africa's Greater Kruger Park. About Youtuber Connect with your favorite creatures from WCS's five wildlife parks in New York City: the Bronx Zoo, Central Park Zoo, Prospect Park Zoo, Queens Zoo, and New York Aquarium. Meet some of the people who care for the animals, and hear from wildlife conservationists in the field. Learn how we are working to protect the world's last wild places—and find out how you can help. About Youtuber Experience Nature in all it's glory as we bring you the exciting worlds of the Jurong Bird Park, Night Safari, River Safari and Singapore Zoo. About Youtuber The Wild Report is your top source for nature, science, and exploration. Our wildlife videos will show you how amazing your own backyard can be, and the incredible array of discoveries that can be made just a few feet from your front door! About Youtuber Wildlife studies by artist Robert E Fuller. The acclaimed British wildlife artist likes to immerse himself in the daily lives of animals and birds to lend authenticity to his final paintings and sculpture. These short video clips are filmed during his studies and the moments they capture reveal the unique characters of his wild subjects. About Youtuber Colorado Wolf and Wildlife Center is located just west of the small town of Divide, CO. Founded in 1993 as the Wolf-Hybrid Rescue Center in Lake George, CO, we have evolved into the Colorado Wolf and Wildlife Center. We are an Association of Zoos and Aquariums sanctuary, one of only a handful in the Nation, a very high honor and incredible achievement. About Youtuber Videos from Defenders of Wildlife, one of America's leading advocates for the protection of native wildlife. For more than six decades, Defenders of Wildlife has been a leading force in the protection of wildlife and wild lands. About Youtuber Jim Corbett National Park is an ideal home for many majestic animals like the Royal Bengal Tiger, Asiatic Elephant, Reptiles, Birds and many other wild animals. About Youtuber Here you will find regular updates of highlights from all our live cams, films on wildlife gardening, how to watch wildlife, foraging and loads more. There are plenty of giggles along the way too! About Youtuber Wildlife SOS was established in 1995 by a small group of individuals inspired to start a movement and make lasting change to protect and conserve India’s natural heritage, forest and wildlife wealth. Watch exclusive videos of how we evolved, our programs, founders interviews, talks or just our animals have fun! About Youtuber The mission of Colorado Parks and Wildlife is to perpetuate the wildlife resources of the state, to provide a quality state parks system, and to provide enjoyable and sustainable outdoor recreation opportunities that educate and inspire current and future generations to serve as active stewards of Colorado's natural resources. About Youtuber This channel is about learning things about wild animals. About Youtuber See some of the most amazing, behind-the-scene videos of the wildlife that comes to Woodlands Wildlife Sanctuary for help. These fascinating stories are recorded for your enjoyment by Monika Melichar, who runs the wildlife centre in Ontario, Canada. About Youtuber Other animals around the world are lonely too, facing extinction, and being lost forever. About Youtuber Belgian Wildlife Filmmaker passionate about the riches of the natural world. About Youtuber Named after a passionate earth-mother wolf with a fire in her belly to protect anything vulnerable, Earthfire was founded in 2000 to develop a new model of relating to nature through the voices of the rescued wildlife under its care. About Youtuber Managing fish & wildlife resources for their long-term well-being & benefit of people. About Youtuber Travel 4 Wildlife is dedicated to wildlife adventure travelers. We bring you video reviews, tips, how-to's and articles about how to see the world's most amazing wildlife. Our goal is to promote wildlife conservation through responsible wildlife tourism. About Youtuber Wildlife of Belarus brought to you by Dmitry Yakubovich. About Youtuber African Wildlife Foundation's mission is to ensure wildlife and wild lands thrive in modern Africa. About Youtuber The Wildlife Gallery's YouTube channel is all about bringing an entertaining and educational flow of videos to the hunting and outdoor wildlife community. Our variety of videos range from tips for the hunter, time lapse taxidermy videos, client testimonials, and promotional and advertisement videos. About Youtuber A residents view of the stunning array of wildlife found at Pecanwood Estate, Hartbeespoort Dam, North West Province, South Africa. About Youtuber Due to recent changes in Youtube , this channel will be dedicated towards pictures and videos of animals and wildlife in South Mississippi. About Youtuber To conserve, enhance and promote Georgia's fish and wildlife resources and outdoor heritage through science-driven research, management, regulation and education. About Youtuber We are working for an environment rich in wildlife for everyone. With more than 800,000 members, we are the largest UK voluntary organisation dedicated to conserving the full range of the UK’s habitats and species, whether they be in the countryside, in cities or at sea. About Youtuber Wildlife Trust of India is a national conservation organisation committed to effective action for the protection of India's natural heritage. Our principal objectives include managing or preventing wildlife crises and mitigating threats to individual wild animals, their populations and habitats through holistic strategies and practical interventions. About Youtuber We are Wildlife Warriors. We fight for an extremely important cause – to protect our wildlife and wild places! Join us on our mission as we follow in the footsteps of the original Wildlife Warrior, our mate Steve and continue the work that he was so passionate about. About Youtuber Join Wildlife Gadget Man Jason Alexander and discover how you can use technology to get closer to nature. Wildlife Cameras, Bird Box Cameras, Trail Cameras. About Youtuber United for Wildlife is fighting the illegal wildlife trade. If we reduce the demand, we reduce the supply - and entire species survive. It's time to add your voice to ours and say enough is enough. About Youtuber Since 1947, the N.C. Wildlife Resources Commission has been dedicated to the conservation and sustainability of the state’s fish and wildlife resources. About Youtuber I am Dr. David Steen and I am a wildlife ecologist. Most of my research describes how humans affect wildlife populations, assemblages, and habitats. However, I also like to participate in studies that generate new natural history information for species we don't know much about. About Youtuber The Wildlife African Conservation Team (the only WWF supported conservation volunteer organisation in Africa) is a passionate, hands-on group that provides the opportunity for conservation-mindful volunteers to be a part of important wildlife conservation work in Africa. About Youtuber Skedaddle Humane Wildlife Control is out there everyday humanely removing wildlife from homes and businesses across Ontario, Quebec and Nova Scotia. Watch as we handle raccoons, squirrels, skunks, bats, birds and mice so you don't have to. About Youtuber A channel devoted to wildlife and travel photography, wildlife filmmaking and wildlife documentary. Wildlife and travel videos from all over Africa. About Youtuber WCN is dedicated to protecting endangered species and their habitats. We support innovative strategies for people and wildlife to co-exist and thrive. About Youtuber Cyprus Birding Tours and Wildlife Tours around Cyprus. We offer private Cyprus Birding Tours & Wildlife Tours, (Nature safaris). We can set up custom watching and photography tours all over Cyprus, exploring its unique biodiversity with one of the most expert guides of the island. About Youtuber I'm Emma and welcome to my YouTube channel which explores the science behind the natural world! I am a zoologist who is enthusiastic about anything to do with wildlife and science so I hope you enjoy my channel which is packed full of interesting natural history facts! About Youtuber Hey Guys, We're Just Two Mates Who Love The Outdoors and Catching Wildlife. About Youtuber Amazing trail camera wildlife videos from Asheville / Hendersonville, NC. Most of the videos are from behind our home in the Haywood Knolls subdivision - Hendersonville, NC! Bear, bobcat, coyote, fox, raccoon, deer, possum, turkey vultures and more! About Youtuber I'm Jesse and I love wildlife! Since I was young I have been fascinated by the beautiful creatures that the world has to offer. I love to spend my time in the bush catching wildlife and teaching others about these beautiful creatures. My goal is to spread the word about conservation of wildlife through education. About Youtuber Celebrating the beauty & variety of the flora & fauna that can be found in North America. About Youtuber Welcome to Wildlife Productions YouTube Channel. We only share the best documentaries for the best of your education. About Youtuber Odisha's forest cover is 34 per cent of its land mass and this offers ample opportunities to tap the sites that are home to some of the rare species of fauna. Be it the mass congregation of Olive Ridley turtles at its pristine beaches, flocking of avian species at Chilika lake or the scenic natural splendour of Satkosia, Odisha's Nature tourism products are still to be tapped adequately. About Youtuber Southwest Wildlife is a non profit organization that has rehabilitated thousands of sick, injured, orphaned, displaced, and abandoned wild animals. Over 70 percent have been successfully released back into the wild. About Youtuber It's been the greatest gift of my life to be able to travel and to see the natural world in the way that we have. But it's nothing really unless you can share it. My hope is that my videos will touch people's hearts. Together we can save the Big Cats, our world would be nothing without them. I would love people just to connect to their own sacred nature. About Youtuber Veterans For Wildlife is an International charity that was started as a direct response to the increase in wildlife crime, particularly rhino and elephant poaching in Africa. It aims to aid in the prevention of wildlife crime by utilizing the skills, experience, and knowledge of veterans. About Youtuber Food, Wildlife, Adventure, Art from Southern Costa Rica or Charleston. What we do in and around our property "Ocho Verde". About Youtuber Here you will find all our latest videos highlighting our conservation projects, nature reserves and Yorkshire's wonderful wildlife. About Youtuber Official Youtube Account of Wildlife of India Get the Latest News Videos and Photos of Wildlife of India, Incredible India Have Incredible Wildlife.We are promoting India’s Incredible wildlife and its Conservation. About Youtuber Right now wildlife is under threat and so is the rich biodiversity of our planet. We're on the brink of losing incredible species forever. We won't stand back and we won't give up. NOW is the time to Act for Wildlife. We're fighting to save endangered wildlife around the world and together we can make a BIG difference. About Youtuber Avon Wildlife Trust is supported by over 17,000 members and 800 volunteers. We are the largest local charity working to protect wildlife and inspire people. We care for 37 nature reserves, from ancient bluebell woods to Iron Age forts, nationally important wetlands, and wildflower meadows. About Youtuber The Wildlife Trust of South and West Wales - protecting wildlife for everyone. About Youtuber Elephas maximus or Asian Elephants is the largest land animal. We upload videos mostly from Kaeng Krachan National Park and more National Parks in Thailand. About Youtuber Standing up for wildlife To support and encourage action to create an environment in Cumbria richer in wildlife, prevent further losses of species, wildlife habitats and geological features and encourage their sustainable management Creating and enhancing wildlife havens To acquire and manage a network of high quality nature reserves which are accessible and which contribute to the conservation. About Youtuber The leading conservation charity in Gloucestershire with a vision of a county rich in wildlife, valued by everyone. We manage over 60 nature reserves and run additional projects to protect our wildlife and wild places. About Youtuber We look after 80 nature reserves, speak up for wildlife and inspire thousands of children to discover the joys of the natural world. We are one of 47 Wildlife Trusts working across the UK. About Youtuber SVW is committed to securing a future for wild populations of threatened wildlife in Vietnam through rescuing individual animals, protecting entire populations and ensuring secured habitats. We act to choose the best solutions which have high conservation value, are scientifically sound and consider human needs, empower people to take action. About Youtuber You'll find a variety of videos here from bat care (lots of that!) to astronomy, natural history, and generally goofing around. About Youtuber Northern Ireland's leading local nature conservation charity. About Youtuber This is a live streaming webcam from the remote woods of south western Pennsylvania. There is a wildlife feeder located at this site that will automatically dispense feed four times a day. The camera is a small pan-tilt-zoom camera controlled by the viewers to get close-up's of wildlife in the area. About Youtuber Global Wildlife Conservation protects endangered species and habitats through science-based field action. Preserving the planet's threatened and dwindling wildlife is one of the greatest challenges facing humanity. There are almost 20,000 species of plants and animals worldwide facing the danger of extinction, including 13 percent of birds, 25 percent of mammals, and 41 percent amphibians. 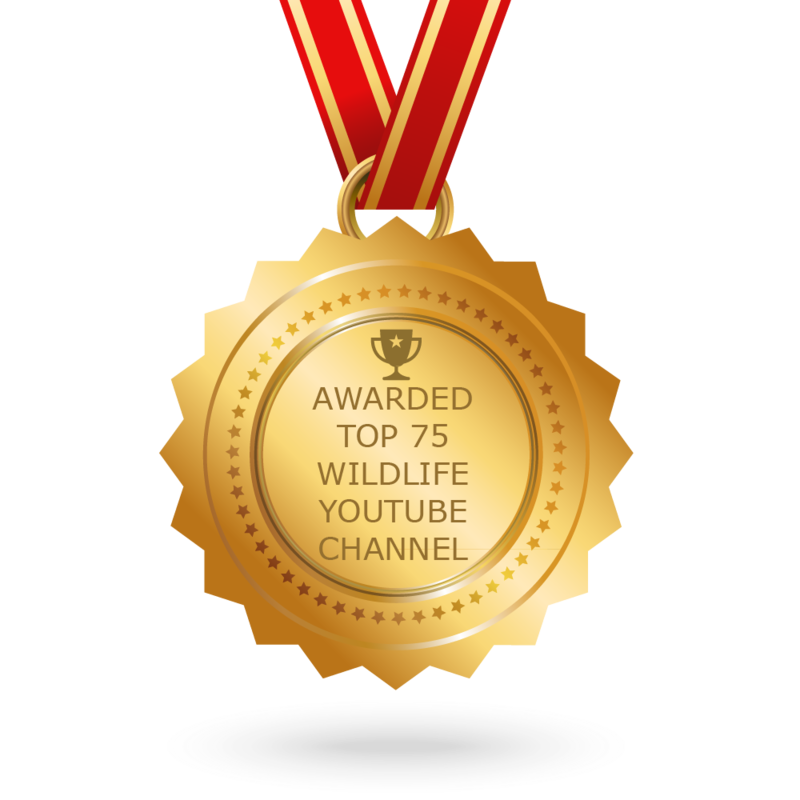 CONGRATULATIONS to every youtuber that has made this Top Wildlife Youtube Channels list! This is the most comprehensive list of best Wildlife Youtube Channels on the internet and I’m honoured to have you as part of this! I personally give you a high-five and want to thank you for your contribution to this world.